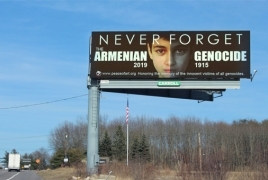 Peace of Art, Inc.continues its 2019 annual Armenian Genocide commemoration campaign in various Massachusetts cities in March and April with five digital billboards dedicated to the 104th anniversary of the Armenian Genocide, honoring the memory of the innocent victims of all genocides, reminding the international community of the first genocide of the 20th century - the Armenian Genocide - as an irrefutable historical fact. The theme of our campaign is "Never Forget", which is represented by an Armenian young boy’s face. The one side of his face is dark and gloomy referring to the wounded Armenia of 1915, stormed by the Ottoman Empire, and the other side of his face is flourishing and bright like Armenia in 2019. "The teenager on the billboard, orphaned in 1915 and survived the genocide, is the same teenager who roamed the whole world being born on a foreign land, the same one who later liberated Artsakh and the same youngster who currently lives proudly in independent Armenia. "In the soul of every Armenian, no matter where he lives in the homeland or abroad, will always live the same youngster that will never forget and never give up, demanding condemnation and redemption for impunity," in his speech underlined artist Daniel Varoujan Hejinian, the president and founder of "Peace of Art" organization.